BRIGHTON, Mich., Jan 24, 2012 – Bold and powerful, the 2012 Ford Fusion is a top choice midsize sedan that you will be excited to drive every time you get behind the wheel. With its sleek three bar grill and rounded rectangular headlights, the Fusion makes pulling into any garage or Meijer parking spot feel like a grand entrance. 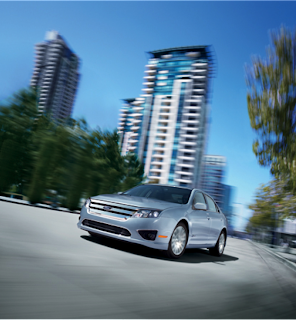 Brighton Ford offers the Fusion in four attractive trim packages, the S, SE, SEL, and sport. There are three different engines offered with the different trim packages, a 175-hp 2.5L four-cylinder engine with a six-speed manual or six-speed automatic transmission. For drivers looking for a little more “giddy-up” in their ride, there is a 240-hp 3.0L V6 with six-speed automatic transmission or a 263-hp 3.5L V6 with a six-speed automatic transmission with the Sport trim, making cruising up to MJR Cinema 20 to catch the latest flick both fun and exhilarating. In the 2002 blockbuster Spider-Man, Peter Parker’s uncle stated, “With great power comes great responsibility.” The 2012 Ford Fusion abides by these wise words. With standard safety features including electronic stability and traction control, security system, six-airbags, and a tire pressure monitoring system as well as optional all-wheel drive it is easy to see why the Fusion was awarded the Insurance Institute for Highway Safety’s top safety pick for midsize cars. Equip your Fusion with Ford’s Sync technology, Navigation system with Sirius XM traffic and travel link, BLIS (Blind Spot Information System), and rear view camera and you will feel like a superhero every time you take your seat in the captain’s chair. While getting up to 33 miles per gallon on the highway, the Fusion will help keep you decrease the number of trips you have to make to the pump. YouTube channel for a virtual walk around.